Generations of fossil hunters have visited the arid fields of the Karoo basin in South Africa in search of ancient life. The rock-layers of the Karoo constitute an invaluable storehouse of information on the evolutionary history of the Therapsids. They have, over the course of a century, yielded up many strange and forgotten Permian beasts – mineralized relics from a time when the Karoo was a far greener place. What are Dinocephalians and what do they have to do with Therapsid evolution? 1) The upper and lower incisors interlocked when the jaws were drawn shut. The lower incisors had surfaces on the tongue-ward side called ‘heels’ that met with the upper incisors to form food-crushing platforms. 4) Significant thickening of the skull bones (“pachytosis”) is a commonplace feature – hence the name “Dinocephalia”, which means “terrible heads”. 5) The temporal fenestra is longer along the dorso-ventral axis than the antero-posterior axis. 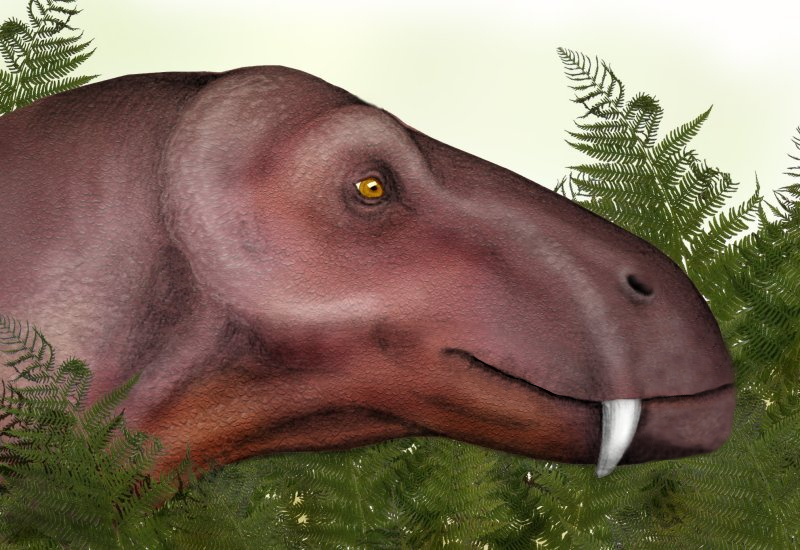 Large herbivorous dinocephalians like Tapinocephalus and Moschops attained weights and lengths comparable to modern oxen and rhinoceri (I seem to recall one author referring to Moschops – an awkward-looking and ponderous creature, judging from standard skeletal reconstructions – as “the Fat Albert of the Permian”). The post-cranial skeleton of Moschops is heavy-set, with several features that assisted in weight-bearing, including a massive shoulder girdle, arm bones with broad, flattened ends and short, stout vertebrae. The forelimbs probably assumed something of a sprawling posture, while the smaller hind-limbs were more erect. The frontal and parietal bones of the skull display an extraordinary degree of pachytosis, with thicknesses of upto 11.5 cm. The functional significance of the thickening of the skull roof in dinocephalians is unclear. The most popular theory is that the male members of these species used their skulls as rams and butted heads in dominance rituals. The temperature physiology of these animals is a point of uncertainty. Dinocephalians were apparently capable of living at high latitudes with highly seasonal weather regimes (their Pelycosaur forebears were, as far as we know, restricted to equatorial climes) and their bone-tissues display patterns of vascularization and growth similar to what is seen in mammalian bones. These are the arguments usually presented in favor of Dinocephalian warm-bloodedness. However, it must also be noted that the Dinocephalians lacked a number of key skeletal features often associated with endothermy in mammals. For example, they did not possess a secondary palate – an anatomical structure that separates the nasal cavity from the oral cavity in mammals. The presence of this separation allows mammals to breathe continuously while feeding. Plant-eating dinocephalians almost certainly found themselves, from time to time, in the predatory cross-hairs of carnivorous dinocephalians. The anteosaurs, for example, were a group of medium and large bodied meat-eating dinocephalians with high, narrow skulls, thickened skull roofs and large, robust canines. They were heirs to a set of ecological niches that, during the early Permian, would have been occupied by sphenacodontid pelycosaurs (including Dimetrodon). The largest known anteosaurs had skulls measuring over a meter in length. Grasses carpet a hinterland plain. The grasses are gnawed down by great itinerant masses of wildebeest. The wildebeest are preyed upon by prides of lions. Food chains of this nature – in which energy flows from land-plant producers (eg. grass) to a class of abundant herbivorous primary consumers (eg. wildebeest) and, finally, to a relatively small population of carnivorous secondary consumers (lions) – are quite familiar to us. However, terrestrial ecosystems may not have always relied so heavily on a productive base of land-bound photosynthesizers. It has been suggested that, prior to the appearance of the Therapsids, land ecosystems were generally more dependent on aquatic productivity. This hypothesis is based on two observations: (1) the unusually high ratio of carnivorous pelycosaurs to herbivorous pelycosaurs in early Permian assemblages. An exclusively land-based food web would require a massive preponderance in numbers of herbivores over carnivores. (2) the abundance of fish-eating forms like Ophiacodon, that may have served as intermediate links in food chains that tied land to freshwater. The was an increase in the relative number of land-going vertebrate herbivores to carnivores after the rise of the Therapsids. The first large-bodied terrestrial plant-eaters were not Dinocephalians (both the Caseids and the Diadectids had played that part before during the early Permian; see my post on Pelycosaurs and on Amniotes), but Dinocephalian diversification (and Therapsid diversification in general) may have played a role in the creation of food-webs that were more plant-based and less fish-based. The reign of the Dinocephalians was short lived – geologically speaking. They perished shortly after reaching the pinnacle of their taxonomic diversity around 263 million years ago, leaving no living descendants. But the Therapsid story was far from over. In the next few posts, we’ll discuss some of the Therapsid groups that ruled during the late Permian, starting with the Gorgonospids and Therocephalians. 1. Kemp, Thomas Stainforth. The origin and evolution of mammals. Oxford: Oxford University Press, 2005. 2. Kemp, Thomas Stainforth, and T. S. Kemp. Mammal-like reptiles and the origin of mammals. London: Academic Press, 1982. 3. Chinsamy-Turan, Anusuya, ed. Forerunners of Mammals: Radiation• Histology• Biology. Indiana University Press, 2011. 4. MacLean, Paul D., Jan J. Roth, and E. Carol Roth. The ecology and biology of mammal-like reptiles. Washington, DC: Smithsonian Institution Press, 1986. Thanks , I have just been searching for information approximately this subject for a long time and yours is the best I have found out so far. But, what about the conclusion? Are you certain about the source? fresh new size if you have had rarely cycled prior. 10-14 months what this means is that mainly has to be administrated when every 10 working days. the benefits to androgenic hormone or testosterone. during a cutting action. Enanthate will be exactly mildly liver toxic. androgen is employed to produce muscle.